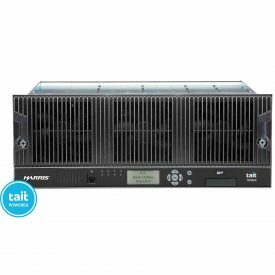 Harris TB9400 is a powerful P25 Phase I and 2 Digital repeater that can be mounted on a standard 19 inch rack. With dimensions of 19 x 7 x 15.8 (WxHxD) and a continuous power rating of 50W or 100W available in VHF & UHF, clarity and range will not be an issue. TheTB9400‘s Wide frequency range 400-440Mhz , 440-480Mhz, 760-870Mhz in UHF and 148-174Mhz VHF bands allow 1000 channels of FEDERAL and Commercial frequencies to be programmed. TheTB9400 can be programmed to emit as little as 5 watts when low power is required. TheTB9400 repeater is available with an internal Duplexer. Its internal power supply is designed to work with 110-240V AC and/or 12,24,48Vdc. TheTB9400 auto switches between P25 Digital mode 1 and Digital mode 2 for Trunking and conventional repeater modes permitting easy migration from Analog to Digital. TheTB9400 ‘s compact size, features and ruggedness offers Federal agencies, Fire Departments, Police Departments a fully featured repeater that can be easily upgraded from single repeater site coverage to multiple repeater site coverage via IP. TheTB9400 is covered by a standard 2 year Manufacturer’s warranty.